The Cisco Kid is a fictional character found in numerous film, radio, television and comic book series based on the fictional Western character created by O. Henry1 in his 1907 short story "The Caballero's Way", published in the collection Heart of the West, as well as in Everybody's Magazine. In films, radio and television, the Kid was depicted as a heroic Mexican caballero, even though he was originally a cruel outlaw. In O. Henry's original story, the character is a 25-year-old desperado in the Texas-Mexico border country who bears little resemblance to later interpretations of the character. He kills for sport and is responsible for at least eighteen deaths. His real name is possibly Goodall2 ("This hombre they call the Kid—Goodall is his name, ain't it? "); no first name is given in the story. The Kid's mixed-ancestry girlfriend, Tonia Perez, both fears and loves him. When Texas Ranger Lieutenant Sandridge arrives at her home, seeking news of the Cisco Kid, they fall in love. Sandridge begins visiting twice a week. Eventually the Kid visits Tonia's house and finds them together: He overhears Tonia tell Sandridge that she heard the Kid was in the area, and that she assumes the Kid will visit her soon. She says she will send Sandridge word of the Kid's whereabouts by Gregorio, "the small son of old Luisa," in time for Sandridge to ride off with a posse, find the Kid and kill him. Sandridge departs and shortly the Kid appears, pretending he has just arrived. The Kid sends a message to Sandridge through Domingo Sales, who claims that Gregorio is "too ill of a fever to ride". The message says that the Kid has arrived and explains that the Kid has exchanged clothes with Tonia to foil pursuers. Sandridge returns to Tonia's home and sees two figures in the moonlight: one in men's clothing and the other in women's. The one in men's clothing rides away. Assuming this to be Tonia, Sandridge ambushes and shoots the remaining figure. The victim is Tonia, the Kid having tricked Sandridge into killing his girlfriend. There have been 28 Cisco Kid movies spanning a time frame from 1914 to 1994. There were two silent movies made. One in 1914 and one in 1919. The "talkies" started in 1928 with the majority of the movies made up to 1950. A Cisco Kid TV movie was made in 1994. The Cisco Kid came to radio October 2, 1942, with Jackson Beck in the title role and Louis Sorin as Pancho. Vicki Vola and Bryna Raeburn took supporting roles and Michael Rye being the announcer. The series continued on Mutual Broadcasting until 1945. It was then followed by another Mutual series in 1946, starring Jack Mather and Harry Lang, who continued to head the cast in the syndicated radio series of more than 600 episodes from 1947 to 1956. The Cisco Kid was also a half-hour American Western television series starring Duncan Renaldo in the title role, The Cisco Kid, and Leo Carrillo as the jovial sidekick, Pancho3. Cisco and Pancho were technically desperados wanted for unspecified crimes, but instead viewed by the poor as Robin Hood figures who assisted the downtrodden when law enforcement officers proved corrupt or unwilling to help. It was also the first television series to be filmed in color, although few viewers saw it in color until the 1960s. The information presented here is from many different sources. If you have more information contact us. 1 O. Henry was an American writer whose short stories are known for wit, wordplay and clever twist endings. He wrote nearly 600 stories about life in America. O. Henry was born William Sidney Porter on September 11, 1862, and died June 5, 1910. 2 In 1945 there were three Cisco Kid movies. In the movie "The Cisco Kid Returns" Cisco's real name is Juan Francisco Hernandez. In the next movie "In Old New Mexico" his name was Juan Carlos Francisco Antonio. In the last 1945 movie "South of the Rio Grande" his name went back to Juan Francisco Hernandez. O. Henry only hinted at a last name for Cisco and it was Goodall. 3 In the first movies the Cisco Kid did not have a side-kick. In the "The Return of the Cisco Kid" Chris-Pin Martin appears as Gorddito the Kids new side-kick. The Gorddito character was in eight movies. In the 1945 movie "The Cisco Kid Returns" Martin Garralaga makes his first appearance as Poncho Gonzales. Chris-Pin Martin appears again in later movies as Poncho. 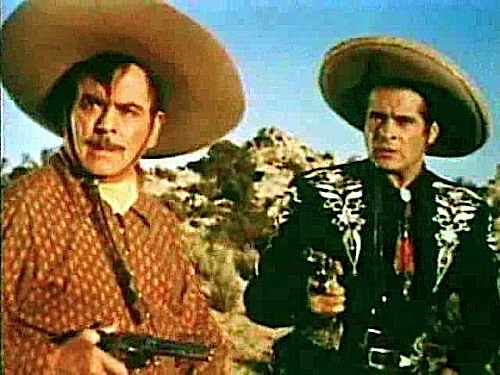 Leo Carrillo makes his first appearance as Poncho in 1948 in "The Valiant Hombre". In the TV series Poncho often says his name but it is not always the same. As close as we can, we think his TV name is Pancho Miguel Fernando Gonzales de Conejo.